On January 11, 2009, the WashingtonPost.com ran an article by the Associated Press, "First US count finds 1 in 200 kids are vegetarian." ...about 367,000 other kids are in the same boat, according to a recent study that provides the government's first estimate of how many children avoid meat. That's about 1 in 200. Other surveys suggest the rate could be four to six times that among older teens who have more control over what they eat than young children do. 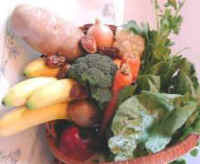 The CDC found that about 1 in 200 American kids under 18 (or 0.5 percent) reported observing a vegetarian diet in 2007. Yet in 2001, a Roper poll commissioned by the Vegetarian Resource Group (VRG) found that two percent of Americans ages 6 to 17 considered themselves vegetarians. That number later grew to three percent in a 2005 VRG poll conducted by Harris Interactive. So it actually looks like vegetarianism among teens and 'tweens has taken a nosedive in recent years. The Washington Post news story was based on a report from CDC about the National Health Interview Survey which looked at the use of Complementary and Alternative Medicine (CAM) by adults and children in the USA in 2007. During the past 12 months did [your child] use a vegetarian diet to treat a specific health problem or condition other than weight control or weight loss? In posting to the Vegetarian Dietetic Practice Group email list, Reed Mangels, RD, PHD of the Vegetarian Resource Group pointed out that, "As you can see, many parents whose children follow vegetarian diets for religious, ethical, animal rights, environmental or other issues...would answer "no" to this question and not be counted." Thus, it is not true that the survey shows that only 1 in 200 kids are vegetarian. And the survey included kids of all ages, not just teens, and younger kids are probably less likely to be vegetarian than are teens, making it particularly fallacious for the CCF to claim that vegetarianism among teens has taken a nose dive in recent years. But when medical cases of 12-year-old vegans with rickets start making the news, the vitamin deficiencies and malnutrition associated with a meat-free lifestyle start to look pretty dangerous. And don't get us started about vegetarian diets and brain shrinkage. A June 8, 2008 story from the TimesOnLine told about a 12-year old vegan girl who got rickets. She was from Scotland where vitamin D-producing sunshine is limited. While it is terrible that this girl suffered from rickets, it is an easy disease to prevent by making sure a child gets enough vitamin D producing sunlight or fortified foods. Most meat-eating children obtain vitamin D from fortified milk. Vegan children almost never suffer from the disease - this girl from Scotland is the only case of which I'm aware. But all vegan parents should make sure their children are getting plenty of vitamin D either through sunshine or fortified foods and supplements. As for brain shrinkage, the CCF links to a September 14, 2008 article from The Times of India in which the anonymous author takes numerous liberties in claiming researchers from Oxford University "have discovered that going veggie could be bad for your brain-with those on a meat-free diet six times more likely to suffer brain shrinkage." A less inflammatory article about this study can be found on HealthHype.com. The abstract of the Oxford University study (1) by Vogiatzoglou et al. does not mention a vegetarian or vegan diet, nor does their entire paper. It does find a correlation between some (but not all) measurements of vitamin B12 status and brain volume in the elderly (who we can assume were mostly meat-eaters). This shouldn't be a big surprise since it has long been known that B12 can affect brain tissue. The very easy answer to this is for vegans to take vitamin B12 supplements. In fact, the Institute of Medicine has long suggested that anyone over the age of 50 eat B12 fortified foods or supplements. For more information on vitamin B12, click here. In summary, there is nothing new regarding the the CCF's claims about a vegan diet. We have known for years that vegans should make sure they get vitamin D and vitamin B12, and there is no evidence that vegans suffer more from rickets or brain shrinkage than meat-eaters. 1. Vogiatzoglou A, Refsum H, Johnston C, Smith SM, Bradley KM, de Jager C, Budge MM, Smith AD. Vitamin B12 status and rate of brain volume loss in community-dwelling elderly. Neurology. 2008 Sep 9;71(11):826-32.